We have another budget oriented heatsink on the reviewing block today. 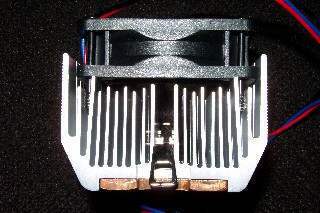 What GT.com loves more than heatsinks, are heatsinks that are cheap! Something that performs, but won't kill your wallet. 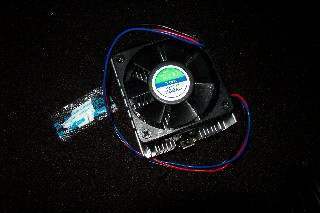 There are a lot of cooling units available nowadays, ranging from $10 to $75. We've got the goods on the expensive units, but we also aim to please the poor folks out there. 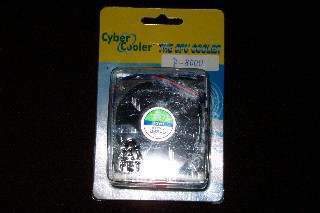 Since our last budget cooler review, we got another unit from Cyber Cooler. We received a larger unit than the previously reviewed CC cooler that we ran tests on. A larger aluminum unit arrived also, which may try to one up our previous sample. 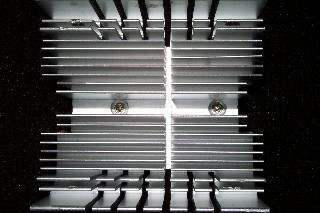 The P-8000 is different than most other budget aluminum coolers in that it has a very large copper base. From the packaging, this cooler may seem rather ghetto. Not much went into the marketing aspect of this cooler, but lets not judge this book by its cover. Sometimes these things can fool you pretty well. One thing that you may notice is the very quiet and slow fan used on this unit. Only 3300rpms, this one will NOT be a late night horror for you light sleepers. This chart may be a little misleading because after watching our fan spin for about 5 minutes, the average rpm was at about 4600. Not a big deal, just something that I thought was strange. 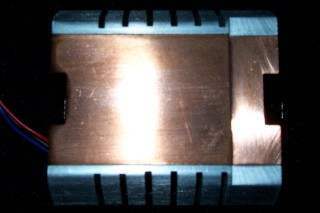 From these profile shots, you can see the layer of copper that lines the bottom of the heatsink. I do have to commend the good design of this clip. 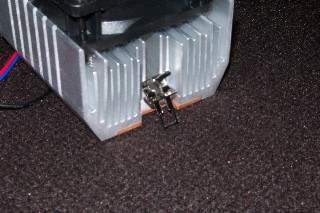 The clips that have the hinge that rocks back and forth are always easier to push down on when installing it onto a motherboard. Some of you may prefer the clips that have screw driver notches. If I could install the heatsink by hand, I rather use that than accidently poking a hole in my board with a screwdriver. The copper is finished in a very smooth surface. I ran my finger across to see if any dents or scratches were made on the surface. Sometimes that affects the outcome on some temperature tests, but this unit felt very clean. With that in mind, I was actually curious as to how that layer of copper is attached to the heatsink itself. 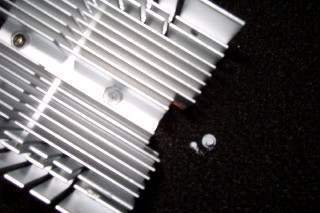 I went and removed the fan and noticed 2 very small screws in the middle going across the heatsink. Seems like the copper base is just attached by these two screws and some thermal paste. The screws are small, so most of my screw drivers had a hard time turning them. I eventually got them both removed but the copper was very hard to pry off. I didn't want to risk hurting the unit, so I played safe and put everything back the way it was.